Last night, here in Montreal, I was lucky enough listen to RJ Palacio tell her story. If that name sounds familiar, I’m not surprised. RJ Palacio is the author of the book Wonder, which tells the story of Auggie, a tough, sweet 10-year-old boy who was born with a craniofacial difference. First things first, if you have not taken the time – parents and kids alike – please make sure to pick up a copy of Wonder and read it soon! RJ shared with the audience that her book was inspired by a true encounter with her own children several years ago. The real-life scene took place at an ice cream shop, where a little girl with a severe facial deformity sat down next to RJ and her then 3-year-old son. When her son cried in fear, Palacio grabbed her kids and fled, all while chocolate milkshakes spilled and fell to the ground. This misguided effort to protect the little girl from her son’s reaction stirred something in the author. She was angry at herself for not simply showing her own kids there was nothing to fear. If she had only started a conversation with the little girl and her Mother, Palacio’s kids would have followed her lead. Sure, they may have still been curious, but they wouldn’t have been fearful. She felt she missed the opportunity to turn an uncomfortable situation into a teachable moment for her kids – a moment to see kindness, compassion and empathy in action. Her mistake that day, was the inspiration for the gift she gave to the world of children’s books. Palacio began writing Wonder that very night because the main character, Auggie, came to her fully formed. 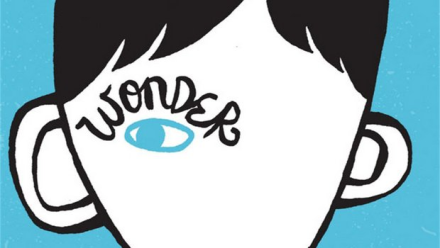 The way Wonder challenges the characters and the reader is nothing short of inspirational. At the center of the story is the very same challenge that Palacio herself faced that day at the ice cream shop: how to confront your own discomfort and choose kindness. We have all been in a situation when we have felt the sting of someone not reaching out a welcoming hand. We, too, have probably all found ourselves in a situation when we chose to pass up the chance to be really kind to someone else because we felt uncomfortable. The inspiration and impact of this book is much more than a ripple. The lessons that we learn from Auggie, his teacher and his friends provide a guidebook for life. Listening to RJ Palacio speak in such a frank, and yet humble, manner ignited something in me last night. As RJ reminded us last night, it’s not enough to be kind when it’s easy and comfortable. It’s not enough to be kind to people we know or people who are just like us. Let’s measure the 51 days of the summer of 2016- and the other 314 days we aren’t at camp – by how we’ve made others feel. Let’s challenge each other to bring that CEL Warm Inner Glow to people 365 days a year!